Grown on a family farm in Fort Fairfield, ME, Premium Ground Cover is a special blend of chopped straw, timothy and alfalfa hay perfect for your lawn and garden. Heat-treated to kill weed seeds, Premium Ground Cover is 100% natural and Mother Earth friendly! 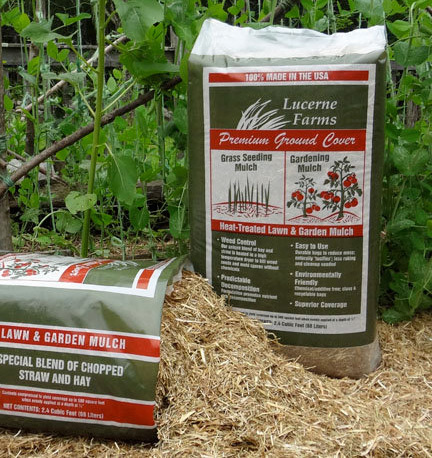 Premium Ground Cover by Lucerne Farms does more than cover your ground. It enriches the soil, adding valuable nutrients and encouraging beneficial earthworms, bringing harmony to your lawn and garden. Lightweight and easy to apply, Premium Ground Cover not only protects newly sown grass seed from birds and the threat of being washed away or drying out, it also conserves moisture and helps prevent weeds from springing up in your garden. Premium Ground Cover is sold by the bale for $18.50. One bale covers 83 square feet at a depth of 1.5” (recommended for weed control). Delivery is available in our service area only. This product can be picked up by arrangement at our Townsend location.